If It's Too Loud...: Big Thief - "Masterpiece"
Brooklyn's Big Thief are set to release their debut album and have released a video for "Masterpiece." "Masterpiece" reminds me a lot of Laura Stevenson. It's 90s inflected pop rock, maybe like a slightly more straightforward Belly. It also edges just enough into folk/Americana territory that I could see them playing Newport in the next few years. (Hey, if Courtney Barnett can play Newport...) With its fuzzy guitars and sing-along chorus, if the rest of their album is anything like this, I could see myself becoming obsessed with Big Thief. Big Thief's debut album will be released this year on Saddle Creek. You can watch the video for "Masterpiece" below. 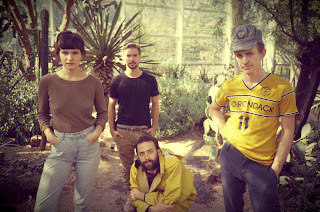 For more information on Big Thief, check out their website. After the video, you can find their upcoming tour dates, mostly supporting Eleanor Friedberger and Yuck. I like this place. I was here the other night, I've been there for about four or five hours and found the prices reasonable on all fronts and the staff to be so friendly. I would be the perfect person to have on an infomercial for venues in NYC if they ever had one.